Our Exclusive Croptoberfest Paper and Stickers evoke a warm fuzzy fall feeling with beautiful muted and textured papers! Our Croptoberfest items are only available for a limited time and are only available directly from a CM advisor. Please contact me if you would like to purchase them. 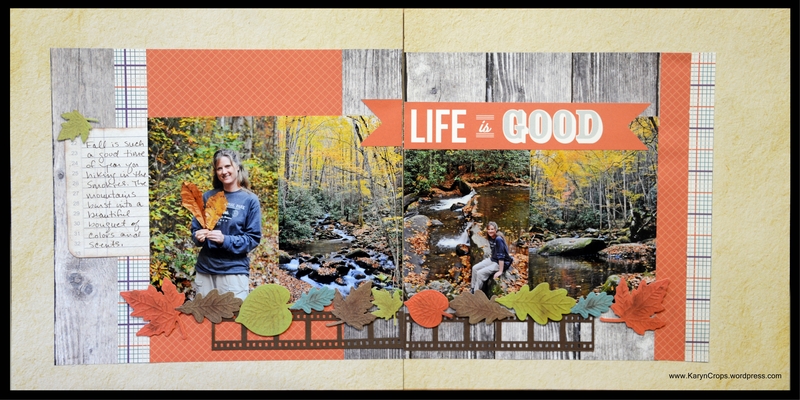 To make my pages below, you’ll need the Croptoberfest paper and stickers, our Maple Leaf Punch and our Border Maker System with Picket Fence Cartridge and Circle Weave Cartridge. I also used our Mint ABC/123 Stickers for my title on this first page. From diamond patterned paper (see photo), cut two 1-3/8” x 12” strips following the pattern of the paper as shown. Noting direction of the pattern, cut dark wood grained paper in half. Cut mottled green paper in half. Lay a piece of the wood grained paper abutted on top of a piece of the green using the grid on your custom cutting system mat as a guide to line up the pieces to a perfect 12″ x 12″ shape. Adhere a border piece horizontally to the center of the page to hold both sides together. Repeat with second page. Using the red blade on the outside edge of the 4” x 6” oval pattern, cut an oval from the orange word patterned paper. Using your scissors cut a little dip in the top center of the piece to make it look like the top of a pumpkin. Using the green blade on the outside edge of the 4” x 6” oval pattern, cut an oval from the brown cardstock. Adhere the patterned piece on top of the brown piece. Use scissors to trim the brown cardstock to follow the dip that you had previously cut in the patterned paper. Using the red blade on the outside edge of the 3.5” x 5” oval pattern, cut an oval from the orange word patterned paper. Using the green blade on the outside edge of the 3.5” x 5” oval pattern, cut an oval from the brown cardstock. Cut both pieces in half vertically and adhere patterned pieces to the brown pieces. Using your scissors, freehand cut a stem piece from the green word patterned paper. Adhere this piece to the brown cardstock and cut brown cardstock with scissors to create a mat for the green stem piece. Assemble and adhere your pumpkin pieces on the first page as shown. 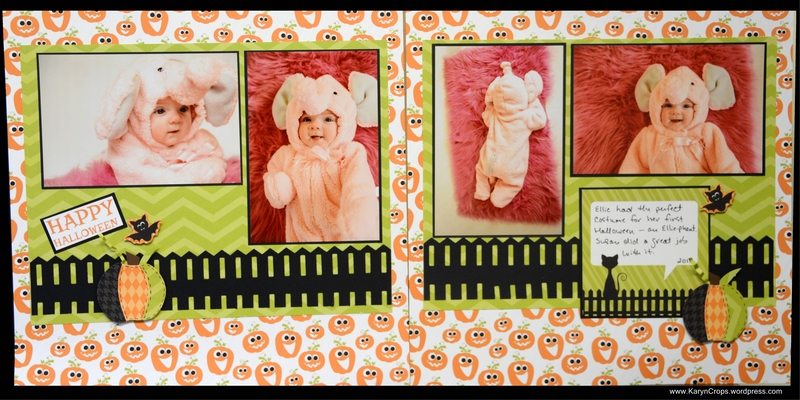 From red word patterned paper, cut two 4.25” x 6.25” photo mats and mount photos. 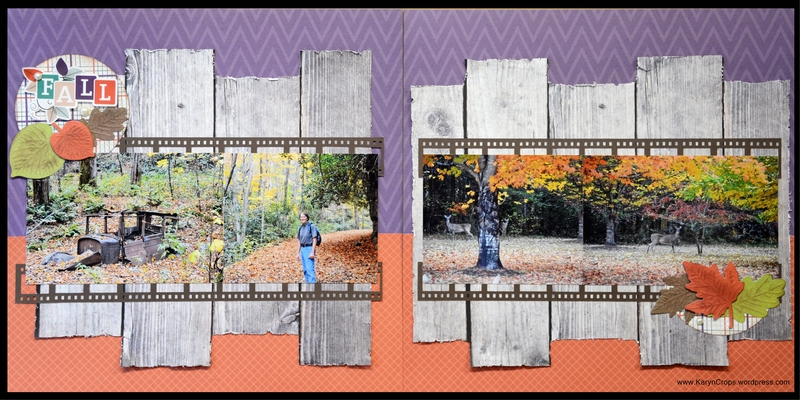 From beige wood grained paper, cut four 3.75” x 3.75” photo mats. Crop four photos to 3.5” x 3.5” and mount on mats. From the backside of the paper with the journaling boxes, cut a 4.75” x 3” journal box. From dark brown wood patterned paper, cut a 5” x 3.25” mat for the journaling box. Adhere photos and journaling box to pages. Using the border maker with picket fence cartridge, punch two borders from the dark brown wood patterned paper. Use foam squares to adhere to bottoms of pages. Using maple leaf punch, punch leaves from the red word patterned paper, green word patterned paper and the orange word patterned paper. Adhere “Love This” sticker to green word pattern and trim to a ribbon shape. Add leaves and stickers to page as shown using foam squares on the ribbon piece and green leaf. Cut two 1.5” x 12” strips from the dark brown mottled paper. Cut two 1” strips from the green word patterned paper. Using the border maker, punch two circle weave borders from the dark brown wood patterned paper. Layer and assemble pieces as shown. Noting direction of the pattern, cut the beige wood grained paper in half. Noting the direction of the pattern, cut the diamond patterned paper in half. Lay one of each piece side-by-side on top of your custom cutting system mat using the grid so that the pieces line up to a perfect 12×12 shape. Adhere a border piece vertically to the center of the page to hold both sides together. Repeat with second page. From the backside of the paper with the journaling boxes, cut a 4” x 3.25” journal box. From the brown mottled paper, cut two 4.25” x 6.25” photo mats and a 4.25” x 3.5” mat for your journaling box. From the green word patterned paper, cut four 4.25” x 4.25” photo mats. Crop four photos to 4” x 4” and adhere to mats. Adhere all of your photos and journaling box to your pages. From green word patterned paper, red word patterned paper, and orange word patterned paper, punch leaves using maple leaf punch. Layer stickers and leaves using foam squares on some pieces as shown. For instructions to make this page, please search Google for “sunburst scrapbook page”, and you will find several tutorials and YouTube videos. This month, CM introduced a new fall-themed product line appropriately named Fall In. The line includes: Fall In Fast 2 Fabulous Album with pre-decorated pages, Slide-In Pack of decorated cards, Paper Pack, Leaf Embellishments, Title Stickers and ABC Letter Stickers. 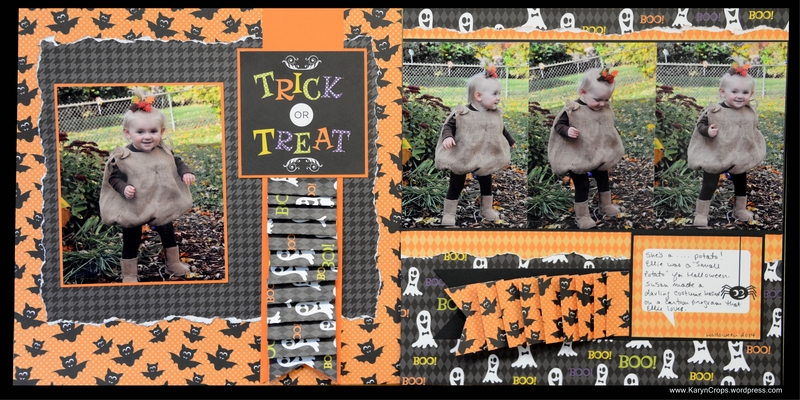 I used the Paper Pack, Leaf Embellishments and Title Stickers to make the pages below. I used the old CM Paper Edger to rough up the edges of the wood patterned paper and our old Chalking Inks to enhance the embossing on the leaf die cuts. I also used the Border Maker with the new Film Strip Cartridge to make a photo mat. Again I used the Chalking Inks to embellish the leaf die cuts and adhered the leaves with Foam Square Adhesives. I also used the Border Maker with the Film Strip Cartridge.